Banana pudding is such a classic dessert, especially is the south. The creamy pudding is perfectly contrasted by the crunchy vanilla wafer cookies. Real, chopped bananas just add to the perfect combination of smooth and crunchy. While many recipes use vanilla pudding, this recipe has some extra banana flavor as it is made with banana flavored pudding as well. This dish is also even creamier and more rich than most puddings you may have had because there is no whipped cream or cool whip cutting the flavor and texture of that perfect pudding. This is definitely going to be the best banana pudding recipe you have ever tried! In a medium sized mixing bowl, combine the cold milk and pudding packet. Whisk together and let the pudding sit for about 5 minute to thicken up. Scoop about 1/2 cup of pudding on top of the wafers and spread along the bottom of the dish. Slice the banana into thin, uniform slices. 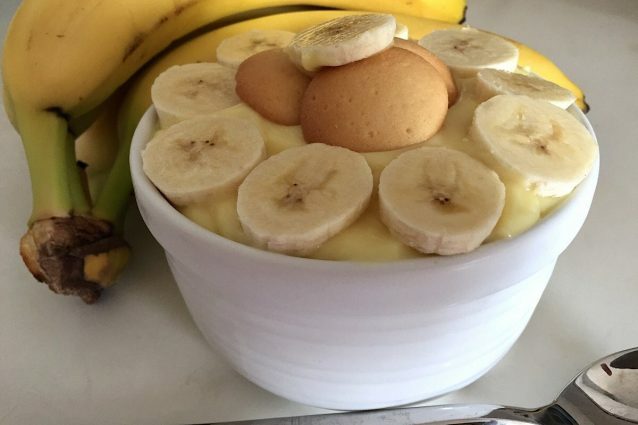 Place a layer of bananas on top of the banana pudding layer. Repeat layering the cookies, pudding and bananas until you have reached the top of the dish. Garnish the top with banana slices, vanilla wafers or whipped cream as desired. Serve cold! -Bananas turn brown fairly quickly and while the banana slices inside the pudding should be protected from browning for about a day, do not use bananas as the garnish until right before you serve the pudding. You can also skip the banana garnish and just use the cookies or whipped cream! -If you have a clear serving bowl, make the pudding look even more presentable by placing the vanilla wafers pressed along side of the dish and then filling it with the pudding. The pretty brown circle wafers and yellow pudding makes a pretty display through a glass dish.